When the girls met up this morning, it was about 30F but the sun was shining! The rail trail is completely off limits right now due to the ice. 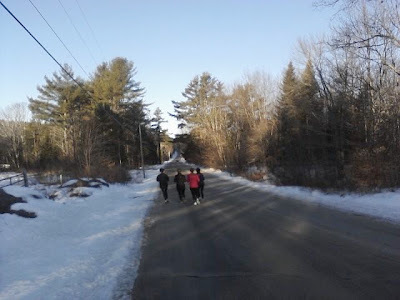 I'm hoping that the weather will cooperate and we can return to our beloved rail trail sometime next month, but until then, we'll be running the roads of Gardiner, Richmond and Wiscasset. This morning we met up at Kim's house, which meant she got to plan the route. To be honest, at first I wasn't excited about the hill she took us on, but it was at the beginning and it really wasn't as bad as hills we've done before. All in all, the route was enjoyable. It's great to change things up and to try different routes. The route actually took us along the same River Road I ran yesterday but a totally different stretch of it. Maybe someday I'll do the entire stretch from Richmond to Gardiner? I did actually bring my phone with me, so when the girls weren't looking, I took some pictures. 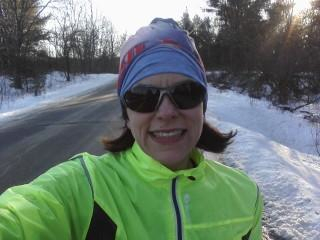 Today was our last run until the Midwinter Classic 10 Miler - which is next Sunday. I may or may not drive Ward crazy all week with questions like - am I tapering too much? should I taper? should I run? what should I expect for a time if my 10k is this and my 1/2 is that? He may move into the barn for the week just to avoid me. I can't say I wouldn't blame him at all. Before a new any race, I get kind of on the crazy side. Just a little. 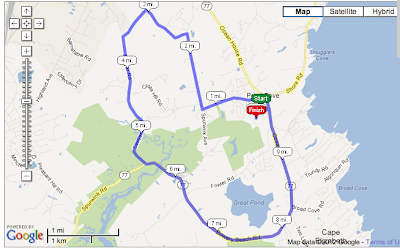 Until then, I'll probably be over-analyzing every twinge or muscle tightness and obsessing about the course map. Do you get crazy before a new or any race? Do you taper? & more importantly, have you been tagged in the 11 Random Things/Questions? I was just tagged 2x in the past couple of days, so I need to get working on that & tag some peeps out there. Do you want to be tagged? I have been tagged in the 11 things idea. I'm working on it. Maybe it'll be up this week. I love long runs with the girls, or anyone....haha , those miles get lonely by yourself... good luck on the 10 miler. I haven't been tagged , would love to be, and looking forward to reading your random things...I think it's a fun way to get to know someone. I have not been tagged but I sure do love reading all of the answers!! Oh yay - it's working (on my mac) - I'll tag you! - Ugh! I want the reply button to work SO bad. @Brigid - I get so antsy too. Can't wait to read your 11 things! @Lisa - I'll tag you!!! I am quite appreciative to have my girls to run with - I'd be so lonely without them! Wish you had a group too! I taper before anything longer than a 5k. It is fun to try different routes. my reply button does not work either..very annoying to have it and be able to use it. I love the pictures! Don't feel like a spazz, I stress/excite myself out before a race, especially a new one. I haven't been tagged in the 11 randoms but I'm definitely loving all of the answers :) Everybody is so interesting!! Okay - so now the reply feature only worked on Holly's! @ Christy - I usually "rest" 2 days prior to a 5k so I have fresh legs....:) Guess I'll "rest" a lot this week! @ Jenn - I'll tag you! I only have only run a couple of races, but my taper before my marathon was crazy. I thought for sure I'd forget how to run long distances... then again, I had a rough race, so next taper might be scarey ... my poor husband! I would definitely taper! But it drives me nuts and I'm constantly second guessing it :) Good luck on the race! I haven't run a race longer than 4.5 yet; however, I am planning on 3 1/2 marathons this year and I'm SURE I'll taper before all of them. I tend to get antsy before races/courses I haven't run before. I worry about silly things like "will I see anyone I know" "where do I park" "I hope I don't come in last" and "do I feel ready for a PR?". Sometimes we taper, sometimes we don't. It depends on the race, but we will definitely taper for our marathon. I get a little crazy before a race, mostly about what I eat and drink.